This is possibly the most popular book on strategy. I just did a quick search at amazon.com to see the star rating and a massive 155 people have reviewed it with an average 4-star rating. This is impressive when you consider that Michael Porter's Competitive Strategy has an extra half-star but from only 42 reviews. The authors believe that companies need to break out of the competitive head-to-head 'bloody' red ocean fights and instead look at ways to create uncontested new markets. They use case studies and examples from across a broad spectrum of industries - examples include: Southwest Airlines, Starbucks, Yellow tail, Cirque du Soleil and Curves. 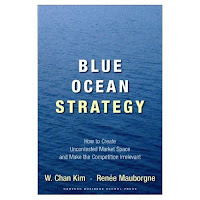 Blue Ocean Strategy is easy reading. And enjoyable stuff. I read it a couple years ago and have tried to push it on any colleagues that even mention the word 'strategy'. This is not a marketing book. However, part of the premise behind Blue Ocean Strategy is understanding the real needs of customers so you can deliver more value to them, while striping out anything that they do not value. Blue Ocean Strategy and many other books are good weekend reads - and many will top the charts for a few years, but Porter's books, including Competitive Strategy and Competitive Advantage will be published year after year, for another hundred yeras and more. thanks for comment alan. I wouldn't necessarily disagree with you. Blue ocean is popular partly because it is easy reading. I intend to add some porter material up here as part of books I like.